Grolsch is one of the most storied names in brewing. Dating back to 1615, the Dutch brewery managed to remain independent for almost 400 years. Sadly, it was bought by SABMiller in 2008, though the company still maintains it's headquarters and brewery in the Netherlands. Accounting for 95% of the brewery's output, Grolsch Premium Lager is by far the company's flagship brew. Not just the face of Grolsch, this beer has also taken on the role of standard-bearer and archetype for the whole European Pale Lager style. If you're looking to get an idea of the style, look no further than the funky green bottle without a body label. That makes this a fitting first example of the style on PintLog. A bit of a catchall, the European Pale Lager style is essentially made up of European lagers that don't fall into the Pilsener category. Generally, these beers have more malt and hop character than their Pilsener cousins with the same focus on noble hops. Like Munich Helles, many of these beers were initially localized reactions to the lager craze. We've got one of the most famous examples ready to roll, so let's get to it. Appearance: A crystal-clear golden-straw body capped by a generous white head that features decent retention and lacing. Aroma: Crisp and clean noble hops over a rich pale malt base. Taste: Herbal, earthy, and slightly lemony hops up front with a pale, honeyish malt backbone underneath. The clean finish features grain and some mild bitterness. A rather straightforward brew, to be sure. Mouthfeel: Medium-light bodied with good carbonation and a dryish finish. Drinkability: Goes back rapidly, making it quite the session beer if you're a fan of the flavor profile. 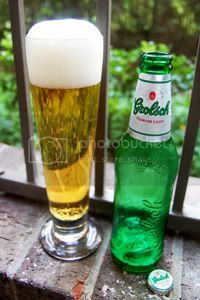 Verdict: Grolsch is a pretty typical example of the Euro Pale Lager style; inoffensive enough, but far from special. Man I totally disagree with B- on this one, but accept it's personal taste. I find Grolsch to be as bad as Heineken. Maybe I just got a fresh/non-light-struck sixer. I was expecting it to be in the "C" territory, too. Definitely a personal taste thing... I disagree with Anonymous that it's equivalent to Heieken. I personally find Grolsch much more drinkable. Inoffensive is an appropriate term.